Henry sets out to build a boat one day. and a shed full of big ideas. 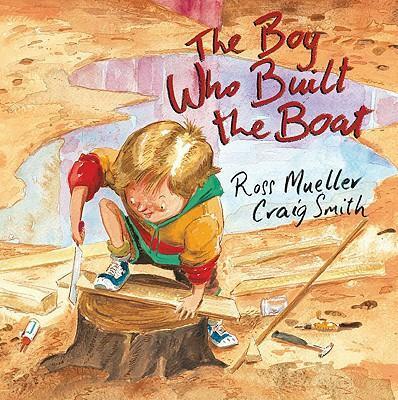 With a buoyant, rhythmic text, ideal for reading aloud, The Boy Who Built the Boat celebrates the simple joy of making things. Ross Mueller is a writer, performer, musician and teacher. He has travelled to schools throughout Victoria with The Living Poets Society, bringing writing to life in performance and song. His work has been nominated for numerous awards and has been produced by La Mama, Playbox, the Storeroom, the National Theatre (St Kilda), St Martin's Theatre for Young People, the Melbourne Theatre Company and the Melbourne International Arts Festival. Craig Smith's warm, exuberant illustrations have delighted children for over thirty years. Craig has won many awards and his titles appear regularly on Children's Choice Award shortlists. Finding humour in domestic, family and school situations, and a fondness for unusual perspectives and energetic characterisation are features of his work. His best known titles include the classics Whistle Up the Chimney (winner of a NSW Premier's literary award), Dreadful David, Where's Mum? and Billy the Punk.